But it’s still slower than a Bentley Mulsanne Speed, somehow. Mansory’s extravagant customization jobs can divide opinions, but its latest creation is surprisingly restrained. After souping up the Bentley Bentayga, the tuner has now given the mighty Mulsanne some extra muscle. The exterior has been enhanced with naked carbon fiber details such as a new front bumper lip spoiler and fog lamps surround. Elsewhere, the luxury limo has been fitted with carbon-fiber side skirts, a subtle trunk lid spoiler, a rear bumper diffuser, and a set of massive 22-inch light forged wheels with “ultra-high performance” 285/35Z tires for both axles. Of course, the upgrades continue under the hood. Mansory has managed to massage the Mulsanne’s 6.75-liter, twin-turbocharged V8 engine to produce 585 horsepower at 4,000 rpm compared to the 512 hp the standard car offers. Combined with an obscene 811 lb-ft of torque at 2,300 rpm, the Mansory-tuned Mulsanne will sprint from 0-62 mph in just five seconds. Top speed has also been bumped from 184 mph to 190 mph. For a luxury limo that weighs 2.6 tons, that’s mightily impressive. 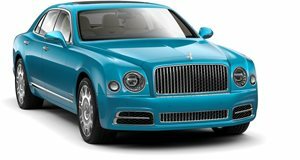 Having said that, Bentley’s own Mulsanne Speed can achieve the same top speed and sprint to 62 mph point one of a second faster.